Today’s high-resolution smartphones provide the infrastructure for rigorous, accurate vision tests – self-administered by anyone, anywhere, anytime. Using light from the screen to display test patterns, an onboard camera for imaging, and ever-increasing processing power, smartphones are the foundation for EyeQue’s low-cost, highly accurate vision screeners. With all of this power, we’re able to develop optometric devices that rival ophthalmic instruments – at a fraction of the cost. Our cloud-based architecture and state-of-the-art software practices provide a secure, scalable, user experience and allow us to continuously deliver new features and tests directly to our vision screeners for our customers. 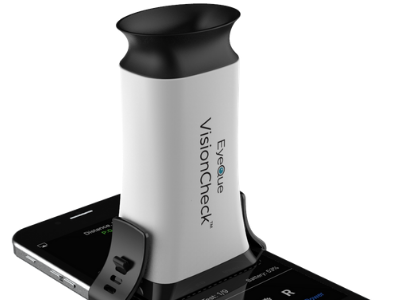 EyeQue’s VisionCheck is an ophthalmic refractometer used to measure how well the uncorrected eye focuses. This is known as refraction error. The VisionCheck is a lightweight, palm-sized, plastic monocular device, containing three precision-optical lenses, and attaches to the smartphone display screen. Viewing the phone screen through the EyeQue VisionCheck, the user moves a pair of red and green parallel lines closer together until they overlap. The amount of movement required for overlap determines the refractive correction needed to get the eye to focus correctly. Doing this process through a few different angles creates EyeGlass Numbers – spherical, cylindrical and axis values, the same optometric values that form a prescription. Since the device does not provide a medical prescription as it is administered by an unlicensed consumer, we have coined the term EyeGlass Numbers. Based on an MIT patent licensed exclusively to EyeQue, the optical principal behind the VisionCheck is called Inverse Shack Hartmann. Once you complete a series of tests, results are instantly processed and analyzed using powerful algorithms in the EyeQue Cloud. The results are viewed on the user’s mobile app or on their personal online dashboard at eyeque.com. Download our Scientific Study comparing our previous generation product known as Personal Vision Tracker (PVT) to a popular office autorefractor. The EyeQue Insight is an expandable vision screening platform that tests for a variety of vision conditions using a smartphone, proprietary optical goggles, and mobile application. The software-based platform allows new tests, features, and improvements to be made available to all users instantly through applications updates. The platform can be run from anywhere in the world, including remote areas where residents don’t have access to eye care, or for populations such as bedridden patients in hospitals. It’s also an excellent device for school vision screenings which currently rely on hard to use, costly proprietary solutions. The Insight has an integrated pupillary distance (PD) ruler. The PD measurement is used to adjust the app images displayed on the phone, creating a more personalized fixed vision environment for testing. Insight currently includes three tests, with additional tests in development. Contrast Sensitivity – measures the ability to discern between varying levels of light versus dark. The ability to detect variations of light helps with depth perception and vision focus in low light conditions when colors are less perceptible and/or when objects and their backgrounds are similar. People who lack contrast sensitivity may have difficulty driving at night, in fog or snow; low contrast sensitivity is an indication of medical conditions such as cataracts, glaucoma or diabetic retinopathy. Color Vision– measures the lack of ability to discern variations in color. Color vision deficiency impacts daily life, from non-threatening activities like matching clothing or identifying items by color, to more dangerous situations like accurately determining traffic lights and signals while driving. Changes in color vision can be an indication of a developing health issue. Our technology persistently randomizes test screens to ensure unpredictability. Results are securely stored in the EyeQue Cloud. Download the EyeQue Insight scientific study comparing the Insight to legacy visual acuity tests. Learn more about the EyeQue Insight here. EyeQue is the leader in at-home vision testing, committed to further developing critical tests in addition to refraction and subjective screenings that can be done at home by the average person, digitizing and storing results for personal health tracking and for sharing with eye care professionals. EyeQue is developing methods to improve refraction testing through accommodation mitigation and we are developing additional tests to be built into the Insight such as a test for peripheral vision and macular degeneration. We are exploring imaging technologies using smartphones to detect cataracts, eye lesions and infections, and other medical conditions. To get the most accurate predictions of eye conditions, we are applying the latest advances in machine learning and artificial intelligence to improve the outcome of the results users get when testing. If you are interested in some of the scientific studies conducted to date we encourage you to download our white papers. EyeQue is looking for optometrists and ophthalmologists interesting in working on the leading edge of technology as we advance home vision testing. Contact us to explore opportunities.